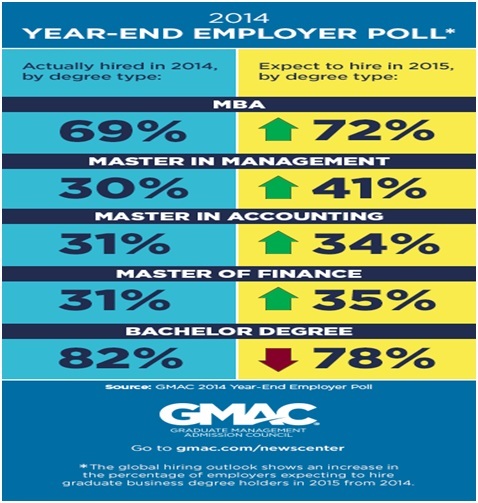 Ending all speculations, 2015 will prove to be extremely fruitful for the MBA job prospects. So, those who are graduating this year, the robust job market will get even better in 2015. According to a new employer survey of business school graduates, 72 percent of surveyed employers expect to hire MBAs, nine in ten employers intend to hire B-school graduates overall, All these major findings are done by the Graduate Management Admission Council (GMAC) in their new Year-End Poll of Employers (January 7). The survey was conducted in late last year (2014) with 169 responding employers from 33 countries. In terms of salary also, the business graduates can expect higher base salaries over the previous year. According to the poll, no employers planned to decrease MBA compensation compared to 2014. Instead, 47 percent projected an increase in salaries at the same rate as inflation. Another 18 percent anticipated MBA pay would be above the inflation rate. The remaining 35 percent reported that MBA wages would remain flat. MBA hiring, which is expected to nudge up three points over 2014, isn’t the only positive sign in postgraduate business education. The Master in Management is also becoming increasingly attractive to employers. In 2015, 41 percent of employers stated that they planned to hire MIM degree holders, an 11 percent increase over the previous year. Over all, this year looks like a golden year for MBA graduates across the globe.